These jaws can be used for contracting around the workpiece or expanding into it without leaving marks. They are ideal for remounting bowls and other items, such as goblet bases without marking, thanks to the rubber sleeved stops supplied with the jaws. 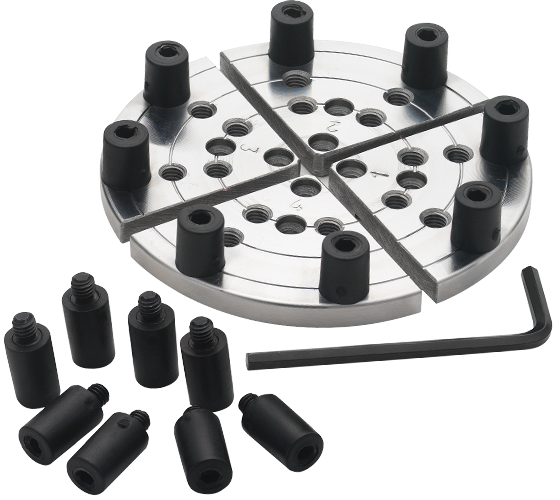 Two sets of these stops are supplied – Eight standard length and eight long stops which give added grip. Each of the jaws features scribe rings at different diameters to give a useful guide when centralising the workpiece in the jaws.